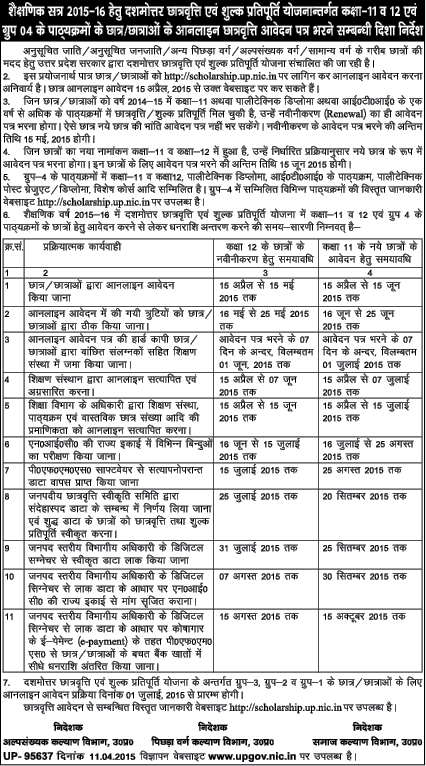 State government of uttar pradesh now going to make changes In Scholarship schemes. A good news now coming for the Middle class families whose annual income is less then 2 lakh . Now government has redefine the family income eligibility criteria for getting the Scholarship (Chatravriti / Vajifa ) . 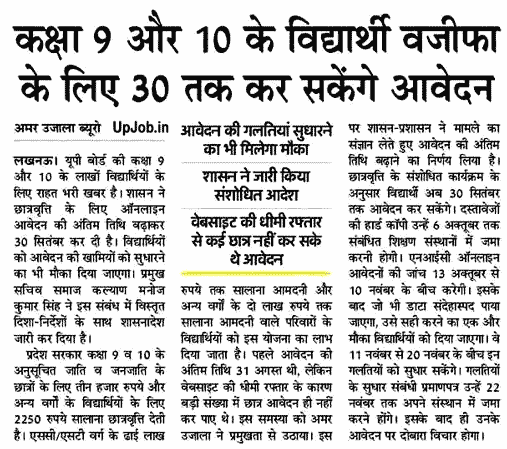 Government will prepare new rules (Niyamawali) for Pre matric scholarship (Purva dasham Chatravriti Yojana ) of class 9 to class 10th level students of uttar pradesh . Now all category of the students will get benefit of pre matric scholarship which is provide by state government of Uttar pradesh in the welfare of poor families . SC, ST, General, OBC, Minority and all other category candidates can fill application form for Purva Dasham Chatravriti Yojana which is given for class 9th and class 10th level students. Revised niyamawali will made for making similarities between categories. This decision was taken by Chief Secretary of uttar pradesh for class 9 and class 10th level scholarship . Government will also do changes in Post Matric scholarship (Dashmottar Chatravriti yojana) and fee reimbursement (Shulk Pratipurti Yojana) . After the new amendment distribution of scholarship will be easy and transparent for all students . Selection procedure for Scholarship : currently Samaj Kalyan vibhag of Uttar pradesh selecting eligible candidates for scholarship on the basis of Family Income , marks obtained by candidates in annual examination , and category of the program which is followed by students. That’s why many of the students every year exempted who really needs scholarship. For resolving this problem government will make new rule for selecting the eligible beneficiary. Government will extend the family income annual limit. Now candidates will get weightage on the basis of annual marks, program category. In case you drop your current program and taken admission in new program then you will not get benefit of scholarship. These scholarships will be distributed after the approval of DIOS. Each district DIOS will approval your scholarship via using there Digital signature. How to apply : Just Like Previous year , all candidates of Pre matric, post matric, Fee Reimbursement and renewal of scholarship , are required to fill application form online only /. Each candidate are required to fill online application form for Up Scholarship Scheme. Scholarship Amount: total 2250 per year Scholarship will be given for eligible students under the pre matric scholarship scheme . But Samaj Kalyan vibhag will provide Scholarship rs 2250 per year for all category of the students . Online registration Process / application form submission for class 9 to class 12 level scholarship and Group 4 and many other program Scholarship application form submission will be started from mid of April . Government will invite online application form from -. All interested candidates are required to fill application form online from 15 April . Last date of application form submission is 30 august . Old Student who applied for the there renewal of scholarship they will get scholarship before 31 October 2018. Newly registered student of Post matric scholarship and fee refurbishment will get scholarship before December 2018. कक्षा 10 व 12 की नवीनीकरण तिथि..
कक्षा नौ एवं 11 के नए छात्र-छात्राओं की आवेदन तिथि..
दशमोत्तर छात्रों के (कक्षा 11, 12 एवं ग्रुप 04 के पाठ्यक्रमों को छोड़कर) नए आवेदन तिथि..
Sir mai bams 1 st year ka student hu eska scholarship kb bhra jayega. .
.....plz ab bataiye mai kya karun un sab ka aur ab wo site open hogi ya nahi..??? Sir btc scholarship ki date bdha di jaye kyuki 22 se class start hui h college 23 ko allote kiya gya ab itni jaldi kaise submit kare puri prkriya nhi ho payegi side bhi slow chal rahi btao sir kya kare. sir mai btc batch 2015 ka sc student hu.mera registration no.420110201601182 hai .meri scholarship mere account no.34695706272 k blocked hone k karan nahi aai.mera account state bank of india ka hai. meri scholarship kab tak aayegi. Sir meri scholarship online submit kerne ki date 11 september hai. But mene aaj hi income certificate banwaya hai and online form me income anukramank no fill hona hai but wo no. Abhi nahi milega so mujhe kya kerna chahiye ?